DEB HAALAND, who last month became one of the first native-American women elected to Congress, experienced what this meant to other Indian women on her first post-poll trip to Capitol Hill. One of the most dismal stories in the run-up to the mid-terms was an attempt by Republicans in North Dakota to suppress the vote of left-leaning Indians. Yet one of the most cheering to emerge from the election was the success of native candidates. Ms Haaland, a veteran activist from New Mexico and member of the Laguna Pueblo tribe, will enter the House of Representatives alongside Sharice Davids, a lawyer, martial-arts specialist and member of the Ho-Chunk tribe from Kansas. According to a count by Mark Trahant of the website Indian Country Today, 103 native candidates ran for office in the mid-terms. At least 60 won, mostly for the Democrats—though Oklahomans elected a Republican Cherokee, Kevin Stitt, to be America’s first Indian governor. This represents an acceleration of a welcome trend. Indians are doggedly beset by poverty, ill health and other social problems. Yet the picture of wretchedness on the reservation this conjures is misleading. Over 70% live in cities, where an educated Indian middle class has emerged. Several factors—including the legal protections and economic benefits Indians secured in the 1960s, the environmental movement, and a cultural rethink by Hollywood—have encouraged anyone with Indian blood to identify as native. This phenomenon, known as Cherokee Grandmother Syndrome, explains rapid growth in the Indian population. It leapt by over a quarter between 2000 and 2010. Ms Haaland is half-white; Mr Stitt does not look Indian at all. Native Americans still represent less than 2% of the population. So none of the candidates for national or statewide office made much of their Indianness on the trail. It helped Ms Haaland win a tough primary, but mainly because white liberals in Albuquerque wanted to send a native woman to Congress. The fact that New Mexico was the last state to give Indians the vote, in 1962, made that especially appealing. Ms Haaland’s ethnicity also helped her shrug off two convictions for drunk driving. She said she had “been sober for 30 years”. A reference to the blight of addiction among Indians, and to her fortitude, that ended the matter. Indian candidates for lower office were more obviously motivated by native issues. They included veterans of the Standing Rock protest against a gas pipeline in North Dakota, in 2016 and 2017, which drew the biggest Indian crowd in decades. Many also focused their criticism of President Donald Trump on his efforts to shrink protection for tribal lands. A decision by the interior department in September to deny a reservation to the landless Mashpee Wampanoag tribe of Massachusetts provided a timely illustration. Such common concerns, uniting America’s 573 recognised tribes, have proliferated as Indian economic interests and cultural identity have deepened. The response of native politicians in Alaska to Brett Kavanaugh’s contentious Supreme Court confirmation was another example of this. They denounced him for his description of Hawaii’s affirmative action for natives as a “naked racial spoils system”. That in turn helped persuade Senator Lisa Murkowski of Alaska to oppose his elevation. A groundbreaking survey of Indian voters, formerly a lacuna in political research, by the think-tank Latino Decisions also points to more unity and engagement. Native turnout was high, including in places such as North Dakota where Indians faced attempts to discourage them from voting. It may have proved decisive in several races won by Democrats by thin margins, including Senate races in Arizona and Montana. And it was highest among voters aged 18-29, who were most energised by Standing Rock. Over a quarter of young native voters had volunteered for a mid-term campaign or voter-registration drive. Yet the survey also pointed to the traditional diversity of Indian views, which makes native Americans unlike other minority groups. They leant Democratic by a slimmer margin than blacks or Hispanics. Almost half of Indian men voted Republican. There were also signs of a long-standing ambivalence towards national politics. Though contemptuous of Mr Trump, most expressed little enthusiasm for either party. It will fall to Ms Haaland and Ms Davids, alongside two existing Indian House members, Republicans Tom Cole and Markwayne Mullin of Oklahoma, to represent such contradictory sentiments. Indians are starting to behave politically more like other groups. Yet they remain heterodox and distinct. Mental health, land rights and criminal justice are among the problems that affect Indians differently, because of their history and because of provisions such as the Indian health service. A danger for the two native women is that, already hailed as champions of Indian social affairs, they will neglect their districts. 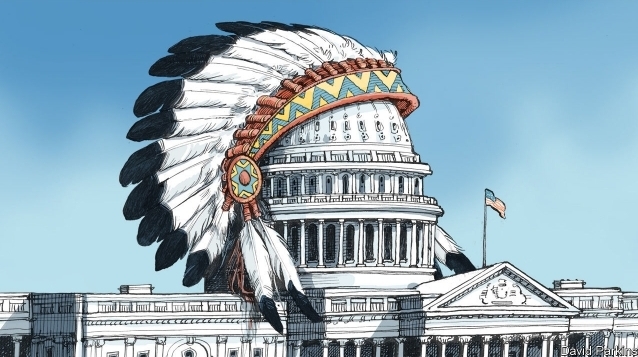 Yet by providing a stronger, subtler voice for native Americans they have an opportunity to accelerate their engagement with national politics. 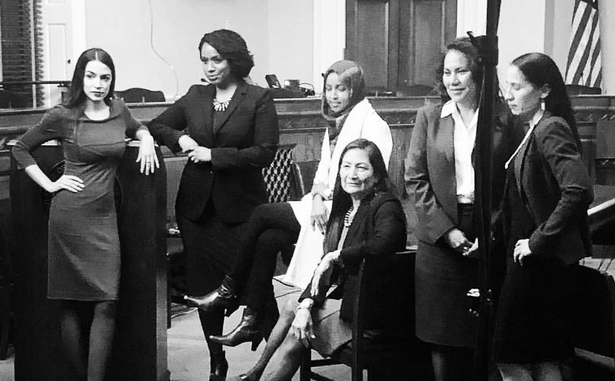 Responses to "Native Women in the United States Congress: The rise of Women politicians"